Welcome to Hot Chocolate Wars 2015! 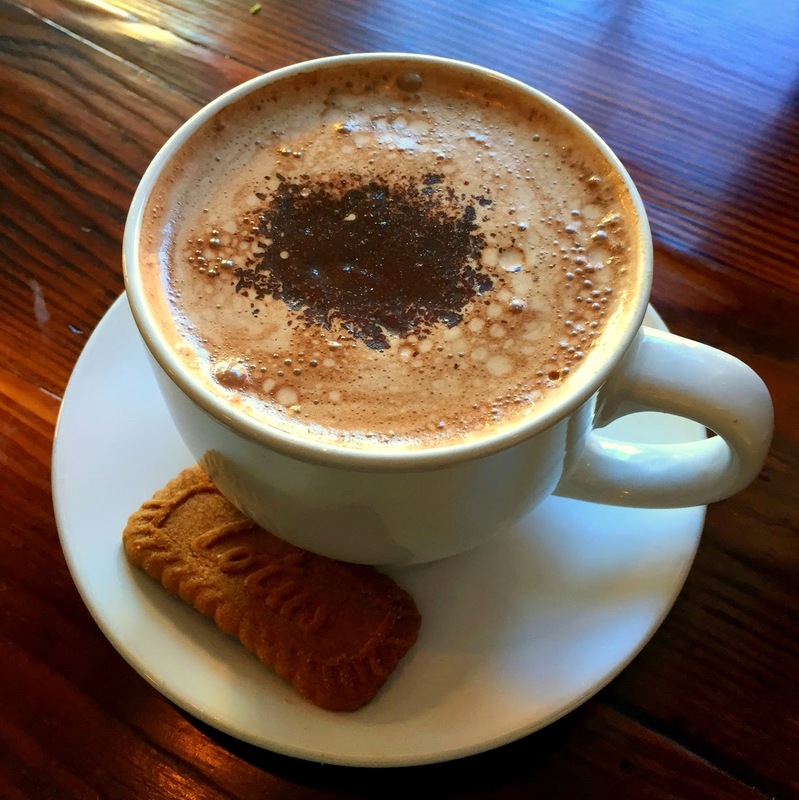 Over the past few years, I've written several posts to help fellow non-coffee drinkers navigate a wide range of options in Philly to find the elusive cup of cocoa that's not lukewarm, bland and/or overpriced. Here are a few new reviews to help you sip the best, with a extra tips about what to munch on, too. Little Spoon is the latest addition to South Street West, taking over the corner spot at 15th & South. From the outside, it looks like a cute little coffee shop to swing in for a quick bite. You can certainly grab a drink to go or sit at one of the few counter spots, but a full menu of breakfast, brunch and lunch options makes Little Spoon more of a sit-down cafe. The hot chocolate offered good chocolately flavor and a bonus biscuit on the side, but fell short on temperature. I've said before that my pet peeve is fancy cafe hot chocolate that starts out lukewarm and quickly turns cold. I won't go out of my way again for Little Spoon's hot chocolate, but do plan to go back for brunch. On a Saturday in December it was packed with a 40 min wait; clearly we needed another spot like this in the neighborhood. Hot chocolate is not listed on the chalkboard menu, but when I asked they said they made it - and make it they did! Ding ding ding... finally a winner! The Bakeshop's hot cocoa was definitely one of the best I've had around the neighborhood lately in terms of flavor AND temperature. I got it to-go, but it started off plenty hot enough to warm up my walk home and stayed that way. 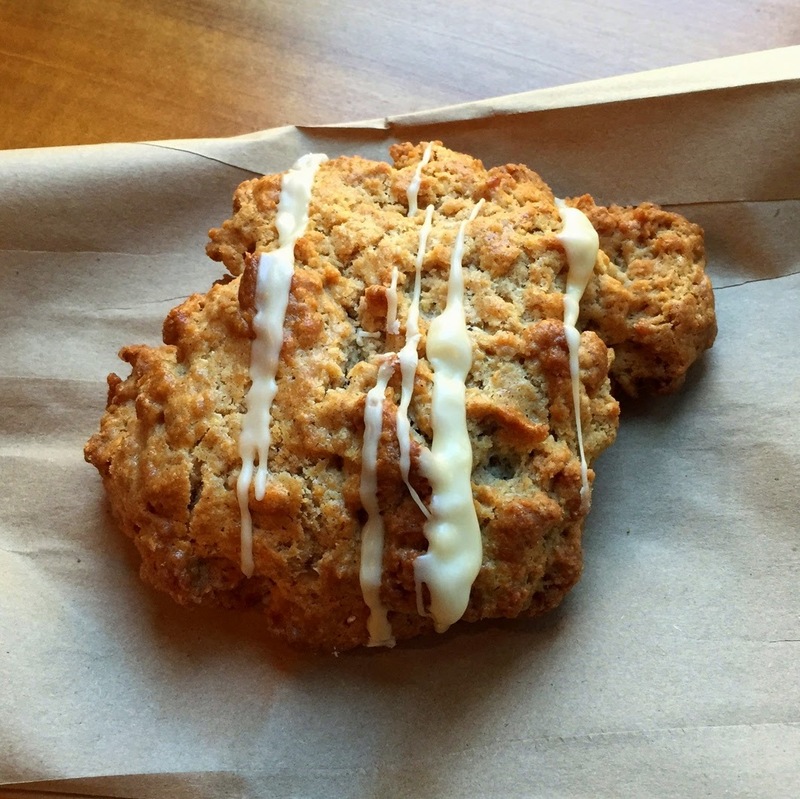 And my cinnamon brown sugar scone was quite good, too. Definitely going back for more treats and hot chocolate. Heading back to South Street, OCF Coffee House is one you can skip if you're jonesing for hot cocoa but worth a swing in for a decent bagel. The bagels come from Four Worlds Bakery at 46th & Woodland. As you read in our Knead Bagels review, great bagels are tough to come by in Philly but an everything from Four Worlds made me pretty happy. OCF also serves gluten free cupcakes from Sweet Freedom down the street. OCF often advertises Nutella Hot Chocolate on its sidewalk chalkboard. It is not on the regular menu inside but usually available. The drink, well, tasted like hot boring liquid. The barista said they just swirl Nutella into hot milk instead of cocoa mix. Could have been a lot more potent but at least it was a deviation from the norm. I tried the regular hot chocolate on a separate visit, and it, too, was pretty bland and lukewarm. Sitting down inside OCF can also be an odd experience. For a while there was no music and only a few people so you could hear every word of the conversations around you. Needs some acoustic help or sound absorption. Readers: where else should I try this year for Hot Chocolate Wars? ?